At Infinio, we're building solutions that improve the data storage performance of virtualized environments. We separate the problem of storage performance from the issue of storage capacity, allowing you to buy performance, not disk. 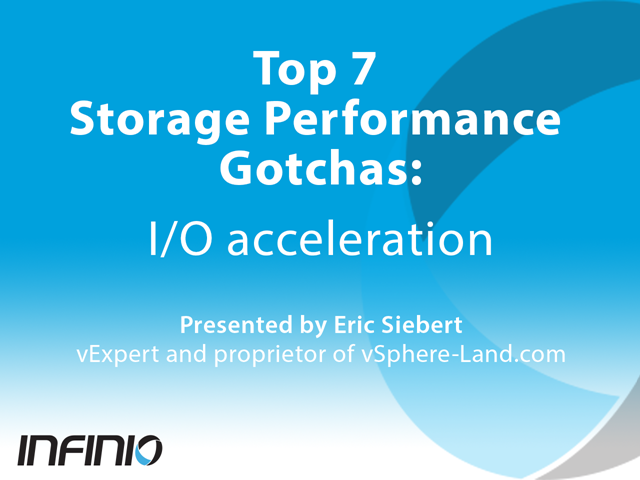 - how storage performance affects the overall performance of your vSphere environment, and how latency is the silent killer of storage performance. Server-side caching can make your virtual machines run faster, your storage run smoother, and reduce your storage spending. But judging performance claims can be difficult if you don't use realistic workloads to generate concrete results. This webinar looks at performance testing in virtualized environments using enterprise-class OLTP, SQL, and Exchange workloads. We'll also look at how benchmark analysis can show before and after results for server-side caching in a vSphere 5.5 environment. In a virtualized data center one of the most vital resources (and most expensive) is storage. Inadequate storage can have a negative performance effect across your virtualized environment. Learn how to balance having enough resources to meet the demand without overspending on resources that just sit idle. Find out how caching can help improve storage performance without requiring additional hardware. Based on current practices in the datacenter and key emerging technologies, now is the time to revisit the debate on performance in NAS-backed virtual environments. We’ll cover recommended practices and configuration tips, and show how state-of-the-art technology changes the cost/performance dynamic for datacenter operations. •Learn recommended practices and configuration tips to improve application performance and scalability of NAS-backed virtual environments. •Assess ways to optimize the host, network, and storage tiers including jumbo frames and link aggregation performance, congestion control and prioritization mechanisms, and common configuration pitfalls. •Evaluate four trending technologies, including 10Gb Ethernet, SR-IOV, VMDq, and edge caching. Evaluate each along the dimensions of performance (throughput, latency) and ease of use, with a cost/benefit summary to illustrate which offers the greatest performance gain for the dollar.